Puzzle Pirates Forums - View Thread - can you swap names with a pirate ? Forums » List all forums » Forum: New Player Forum » Thread: can you swap names with a pirate ? Can you swap names with a pirate ? I just recently got 30 rogue marks and wanted to change my name, I first requested to be able to change my name with the petition but it got denied, because as far as I know, i've heard that you are able to change your name by requesting a petition, is this true ? If you want to swap names with another pirate they must change their pirate name first, and then you can take their name. This would cost a total of 60 RMs. Now what if the pirate hasn't been online for a long time ? What do I do ? If you know them you can contact them out side of the game and ask them for it, otherwise the name is theirs until they give it up. "Swapping" names is something that will take at least 90 Rogue marks, and/or the help of a Developer. Let's say I am named "Joseph" and my friend is named "Jack". For us to swap names, one of us will need to rename to a third name first, such as "Joseph" to "David". Then, "Jack" can become "Joseph" because it is free, and finally, "David" is free to become "Jack". Theoretically, this should not be a problem. You could use any old third-name because it is ostensibly temporary. If someone really wanted to mess with you, he could maliciously steal one of your names while you were in the process of "swapping" because it is not an atomic operation. This is where a Developer might be able to help, but I kind of doubt that they will want to special-case something like this. They will probably just tell you to use the Rogue Marks and take your chances. You can post in the parley forum of whichever ocean this is supposed to happen on, asking if anyone knows how to contact the person with that pirate. Oh, there are thousands and thousands of greenies who seem to have been created for the sole purpose of squatting on a good name. Want to list all the "JackSparrows" who don't actually play? If it's a greenie who hasn't logged in since 2017, chances are they belong to an account that's "protected" by a purchase and they will never, ever be purged. And Ocean Masters are wholly unwilling to usurp these abandoned greenie pirates just to reclaim a good name. Sorry, but you will simply have to be more creative in thinking of a pirate name. Oh, there are thousands and thousands of greenies who seem to have been created for the sole purpose of squatting on a good name. 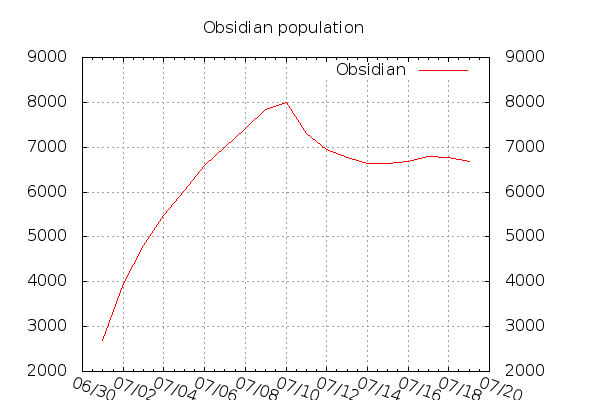 In case anyone thinks that LJ is exaggerative, here are some population plots from right after Obsidian was opened. 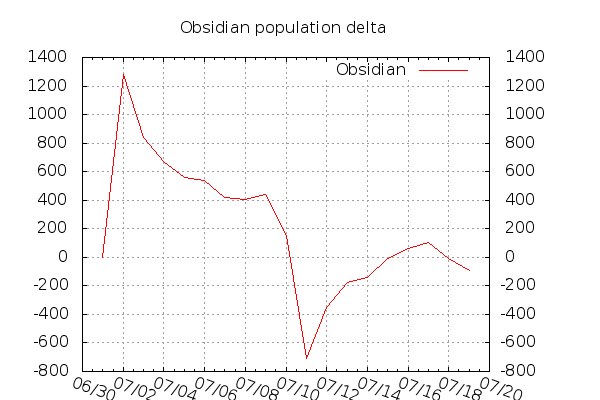 Note that exactly 10 days afterwards, these squatted names go dormant and thus drop off the island population info. So, yeah, maybe a couple thousand names were squatted in the first week, but I'm sure many many more have been added since. Want to list all the "JackSparrows" who don't actually play? I wonder how many of those in your chart had intended to blackmail or at least "sell" the name and/or account to some other victim who wanted it really bad? And I wonder how many of those victims would close the deal, only to find that selling or sharing accounts or passwords is bannable?